As part of his visit to Chulalongkorn University in Bangkok to plan the FIF-supported conference that will be held in November, Prof Tom Watson of the Media School delivered a well-attended workshop on Academic Writing. Four leading universities – Chulalongkorn, Assumption, Mahidol and NIDA – sent over 40 academic staff and doctoral students to the workshop held in the host’s Faculty of Communication Arts building on September 3. “There is a strong push to develop research and publication outputs in Thailand, so the workshop was well-timed to catch that wave,” said Prof Watson. 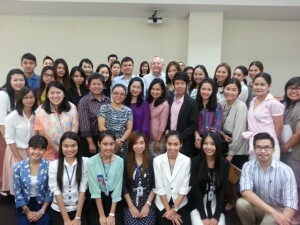 “Our colleagues at Chulalongkorn did a first-rate job in organising and promoting the event. The workshop also gave an opportunity to experience one of the venues to be used by the 1st International Corporate and Marketing Communication in Asia Conference on November 18-19.